Back in the day Andrew Ainsworth was the prop designer who made the original Stormtrooper outfits. This did not make him a rich man. He got £20 per helmet and £385 per suit of armour. 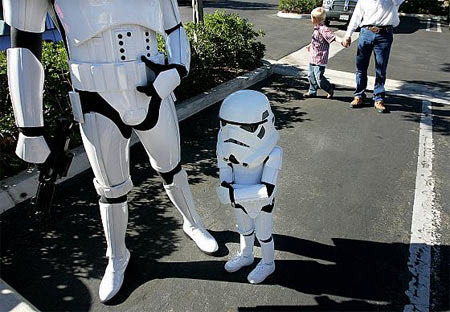 In 2009 Ainsworth was confronted by a lawsuit from Lucasfilm– who are very good with their Jedi lawyers – who had noticed he had been selling replica Stormtrooper helmets. “Stop!” they demanded, Ainsworth did not back down and the battle found itself in the High Court (that’s here in the UK). The UK High Court actually sided with Ainsworth. Lucas decided to take things further and appealed to the Supreme Court. Today we have the decision: Andrew Ainsworth can continue to make and sell replica Stormtrooper helments. If Lucasfilm could convince the courts the 3D works were sculptures, they would be protected by copyright for the life of the author plus 70 years. If not, the copyright protection would be reduced to 15 years from the date they were marketed, meaning it would have expired and Mr Ainsworth would be free to sell them. Ainsworth is now able to sell his helmets for £500 and suits for £1,000. Happy story? I think that depends which side you are on. Steven Spielberg, Peter Jackson and James Cameron will all be upset as they sided with Lucas.